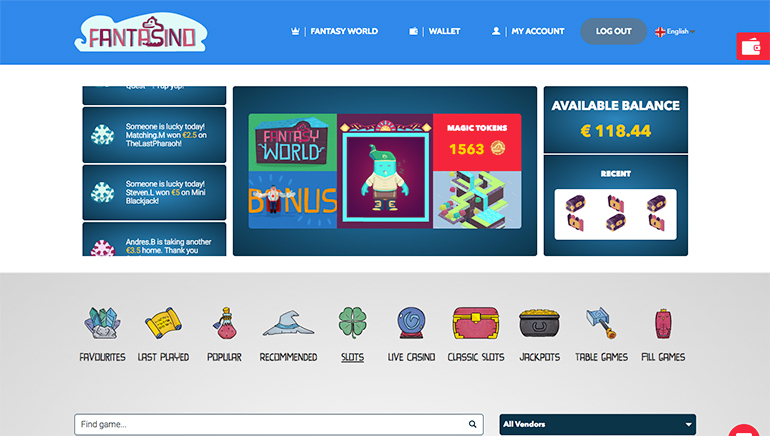 Launched on March 1, 2017, Fantasino Casino is a brand new online casino in that is operated in partnership with EveryMatrix. The casino has definitely made sure that their casino meets the highest standards of design and player experience, which players from Australia are welcomed to enjoy. 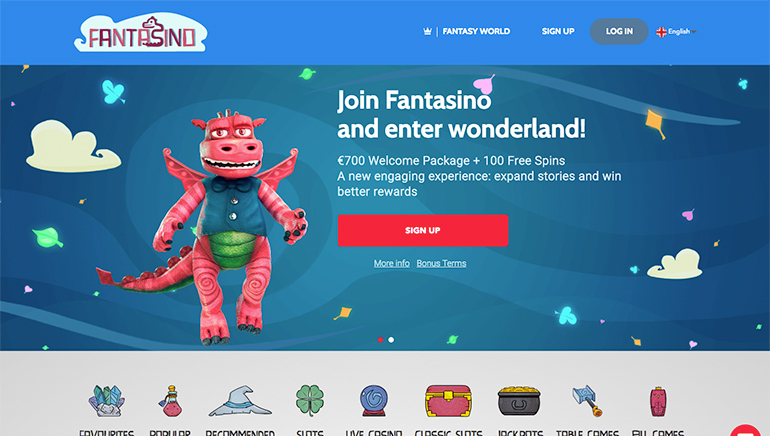 One of the major aspects of Fantasino Casino that sets them apart from virtually all other brands in the industry is that the site actually serves as a game in itself. The casino has created a few 3D characters that lead players through a virtual game experience including Kingslot (the king), Ace (the dragon), Brolor (the faun) and Chesty (the leprechaun). These cool characters look like they are right out of a Disney movie and they will there to help players complete quests, get rewards for playing and when a player levels up. The virtual game and players' Avatar (called a 'Trebol') can be personalized and accessories can be purchased with virtual currency (tokens). 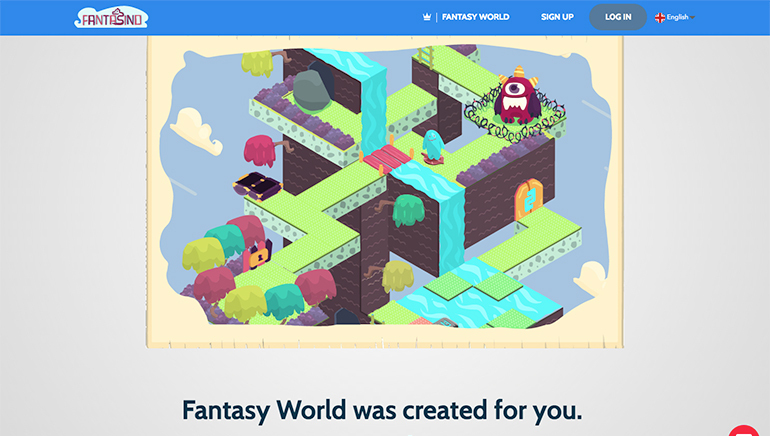 Different games offer different token amounts and players also have the opportunity of unlocking new features in the Fantasy World. No matter how fun the Fantasino Fantasy World may be, it would be useless without the casino providing the best in iGaming entertainment. Luckily, they have garnered the hottest software developers in the industry who have collaborated to provide one of the biggest and best games catalogs you'll likely ever find. There are over 2000 games to choose from by developers like NetEnt, Evolution Gaming, Play’n’Go, NYX, IGT, Betsoft, Quickspin, Playson, Endorphina, Stakelogic, Booming Games, and more. With a solid list of developers like this, and more on the way (Microgaming), the casino has singlehandedly amalgamated one of the most diverse suites in the world. There are slots in all shapes and forms and includes all categories like video slots, 3D slots, progressive jackpot games, classic slots and tons more. Table games are also in abundance and the casino has a wide-range of variations of each type of game like roulette, poker, baccarat, blackjack and more. Fantasino has an incredible live dealer casino option and provides a number of live blackjack, live roulette, casino hold 'em, baccarat and others. The quality of their streaming technology is second to none and players will agree that this is the closest way of playing 'real' casino games from desktop or on mobile device. The casino invites all of their members to take part in the generous offers available at Fantasino. New players will be able to get a big welcome package including a tiered deposit bonus, there are free spins, special prize draws, loyalty rewards, tournaments (from May 2017) and more ways to win. 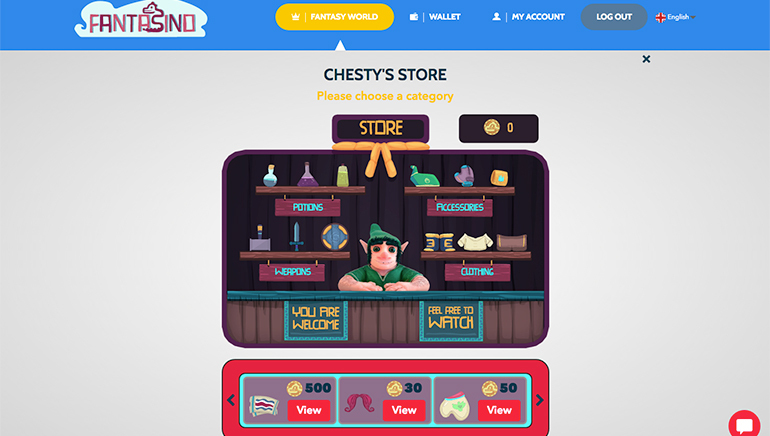 The Fantasy World also rewards players with new items for their Trebol, free cash, cash back offers and much more. Be sure to visit the promotions section to read about all of the options. 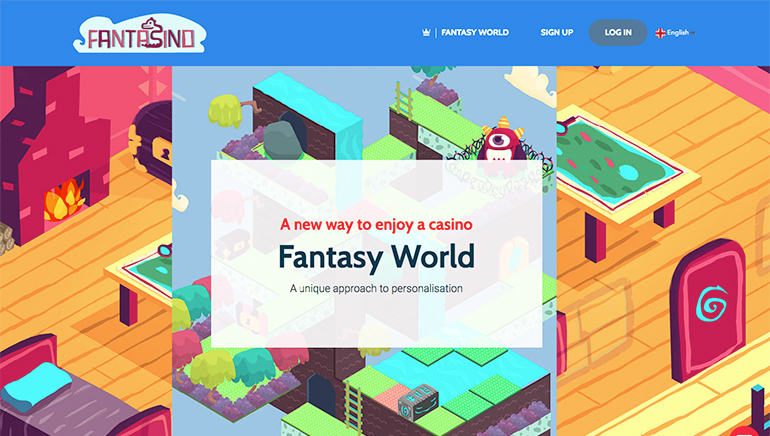 Fantasino has ensured that their players have a safe and secure experience to match with their innovative gaming. Online payment solutions are provided by Visa, Mastercard, Maestro, Neteller, Skrill, Trustly, Paysafecard, Euteller, Entercash, Ecopayz, Zimpler, Giropay, Yandex Bank transfer. The casino support staff is waiting to take your phone calls, emails and live chat, 24 hours a day, 7 days a week. They are committed to a very high level of customer care and in the event that they are needed, players will be able to get in touch instantly.